A portion of the chemical energy released during anaerobic respiration is available for cellular biosynthesis via pathways analogous to those employed by aerobic organisms. However, a significant portion of this energy - much greater than in the case of aerobic respiration - is retained in reduced inorganic end products. When these reduced, energy-rich inorganic compounds are transported back upward to more oxidant-rich (e.g., aerobic) environments (dashed lines in Figure 5), they can serve as energy sources for chemolithotrophic respiration. In this way, the electrons and energy originally captured in organic matter via photosynthesis can pass through both chemoorganotrophic and chemolithotrophic pathways. Where inputs of organic matter are high (e.g., in wetland soils, shallow productive lakes, and nutrient-rich near-shore coastal environments), a large fraction of energy typically passes through these pathways as opposed to being oxidized directly via aerobic respiration. 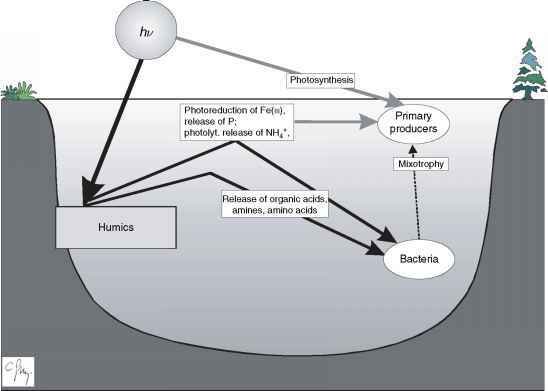 In certain situations, inputs of reduced inorganic compounds from geologic sources (e.g., deep-sea hydrothermal vents, near-surface hot springs, reduced mineral-rich ore deposits; Figure 8) can replace photosynthesis as the primary energy source for respiratory metabolism (indicated by dotted lines in Figure 5). In some cases, higher animals (e.g., tube worms and clams) live symbiotically with chemolithotrophic microorganisms that transfer energy from reduced inorganic compounds to the animals. In these situations, fixation of CO2 by chemolithotrophic respiratory organisms, rather than by photosynthetic organisms, provides the organic carbon to support energy flow and biosynthesis within the community.